This condition, otherwise known as Sever’s disease is a painful condition that occurs in the heel bone (calcaneaus) in patients generally between the ages of 10 to 15 years of age. This is a disease of the growth plate of the bone. As babies, most of our bones are made up of cartilage. The bones have what is known as a growth plate. It is from this growth plate that each bone continues to form eventually becoming adult bones. That is why this condition is seen during development at ages 10-15; this is just before the bones fuse and finalize in their appearance. 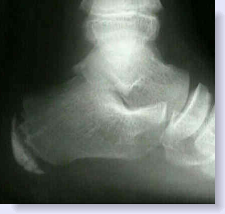 This type of condition is not limited to the heel bone. You will notice that the Achilles tendon attaches into the back portion of the heel bone. 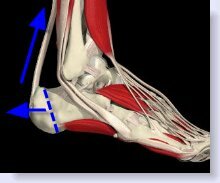 It is thought that the tension created by the Achilles tendon on that portion of bone ‘pulls’ that section of bone away from the remaining section of heel bone at the level of the growth plate (blue dotted line) and thus creates pain (note the blue arrows). Because of this mechanism, this condition is also known as a traction apophysitis. One of the things that is often over looked is the type of athletic shoe worn by the young athlete. An adolescent athlete may be heavy and strong enough to drive the cleats in the heel of the shoe into the ground, but not the cleats or studs in the forefoot which remain on top of the ground. This creates a relative dorsiflexion of the foot to the ankle and will increase the tension on the achilles tendon resulting in heel pain. Additionally, if the child athlete is wearing athletic shoes that only have cleats in the heel and forefoot, but not in the mid portion of the shoe, this too will cause the foot to over pronate and exacerbate the heel pain. Turf shoes or sneakers with an elevated heel or the addition of heel lifts, and cleats in the mid portion of the shoe should help negate this problem. Additionally, athletic shoes that are too worn out in the heel area will also create this relative dorsiflexion of the foot on the ankle. Needless to say replacing worn out athletic shoes may go a long way to reduce the strain on the achilles tendon at the heel bone. Typically, the young patient will complain of pain on the inside and outside of the heel bone. Although not impossible, pain is usually not evident on the bottom of the heel as seen in conditions such as heel spurs and plantarfasciitis. The area may be very tender. It may occur in either heel or both heels. The affected heel may be slightly red and swollen, however, in many cases the heel appears normal. The pain will be worse during practice and will generally only improve somewhat when not participating in their sport, only to worsen once they play again. Obviously, this pain then limits their ability to compete. Diagnosis is made on the clinical history. Pressing on the heel from side to side will result in pain. Pressing on the bottom of the heel generally will not result in pain. X-rays should be taken to rule out a fracture in the area but the growth plate looks the same with or without this condition. Some clinicians feel that in an apophysitis, the growth plate will look a bit more jagged than a normal heel, but I feel the interpretation is very subjective and not reliable. Walking on an injured area tends to delay healing so the pain of an apophysitis can linger. As much as the child does not want to hear it, in many cases rest is necessary to reduce the pain; this may mean giving up their sport. Depending on the degree of pain the patient may try icing the heel both before and after practice. Anti-inflammatory medication may also be helpful taken 30 minutes before practice. Strapping the heel in a basket weave type strap can also be very effective. A podiatrist or athletic trainer should be able to demonstrate how to apply the strapping. Adding gel heel cups to the athletic shoe helps in two ways. The first is that it cushions the heel against impact, and secondly, the heel cup decreases the excess tension on the Achilles tendon thus reducing the "pull" on the apophysis. Many patients who suffer from an apophysitis have a tight heel cord which then puts more strain on the back portion of bone. To see if you have a tight heel cord as a precipitating cause of apophysitis, see the section on achilles tendonitis. . If that is the case a gel heel lift can be very helpful to both take tension off the Achilles tendon and to cushion the heel. Some doctors feel that feet that exhibit too much pronation are more prone to an apophysitis due to the way the heel hits the ground when running (and walking) and that the best way to treat the problem is through the use of orthotics. I would agree with this with one caveat. If the child has a tight heel cord I would not put them in orthotics because in that situation pronation is the way the child is compensating for the tight heel cord and to add an orthotic to this scenario will only increase the tension on the Achilles tendon. I feel a better approach would be to strap the heel to not allow over pronation. In any event, this is a self-limiting condition and will eventually resolve itself. The only variable is how long it will take to resolve in a given individual. A calcaneal apophysitis is not the only source of pain in the heel.